Welcome to the bulk of the Blog. Much like the fruit in a fruit salad or the sun of any solar system, this is the core of the blog and the most important page. This is where the blight side of dyspraxia is outlined. While my main focus of dyspraxic fantastic is to take the stigma out of dyspraxia and make it clear that we can still succeed it would be undignified to ignore the struggles we have to face on a daily basis. 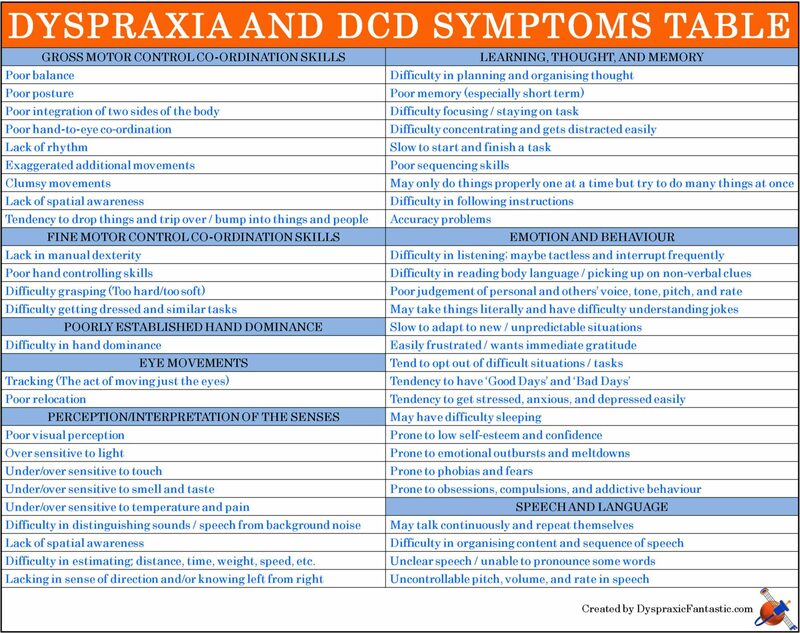 The cold, hard facts of Dyspraxia & DCD is found here split up into different categories for easy reading. The biggest question we get asked is ‘What is Dyspraxia?’ This page is dedicated to answering that very question. Dyspraxia is an impairment or immaturity of the brain which results in information not being transmitted properly. (Click image to enlarge.) Sensory, Coordination, Speech & Language, Physical & Stamina Emotions, Planning & Organisation, and Processing. One of the main ones for those with dyspraxia. Coordination difficulty, whether it is small movements (like the finger movements, etc) or big movements (like walking) all those with Dyspraxia are affected differently by coordination in one way or another. This is a combination of ‘Planning and Organisation’ and ‘Coorindation’ aspects in a way. Speech is planning out words and saying them, those with dyspraxia can struggle with planning thought and that’s why sometimes we wumble up jords… I mean jumble up words! Also, the voice box uses coordination and with those specific difficulties, it can be difficult to speak clearly. Social situations are a tricky business. With dyspraxia we are quite different and unique, people can see this as ‘weird’ and use that as an excuse not to socialise with us. The other problem is saying things out of turn and general awkwardness comes naturally to us dyspraxics and that makes it hard for us to socialise. Sensory is one part of processing our brains can have difficulty with. Another part is other types of information that the brain has to process, for example verbal instructions where information can be easily forgotten – especially when there’s a fair bit to remember. When it comes to planning, those with dyspraxia can have certain difficulties with it. It is also why we can struggle with starting a task because it’s difficult to plan it out. I would say that we dyspraxics are more in tune with our emotions, we can feel strong happiness and strong sadness – a double edged sword really. The thing is we can feel emotions for generally no reason, wake up feeling sad for example. Also, our emotions can be exaggerated more than it should be. On top of all that our self-esteem is very brittle so it can be very easy to put us into a state of anxiety and sadness. It’s why we are prone to phobias, stress, anxiety, and even depression. Dyspraxia can also affect the physical side of life. I feel that this is more of a mental thing (because of a low pain threshold) but also our minds are working so hard and with over-stimulation from the environment it makes us tire easily. I have a lot of energy but once I stop that’s when I feel the effects and find it very difficult to start up again. Personally, I see myself like a steam locomotive, it takes time and a lot of energy to start but once I’m at full speed there’s no easy way to stop me! I have created an introductory brainstorm that outlines some of the main issues we face and just makes for an easier introduction. 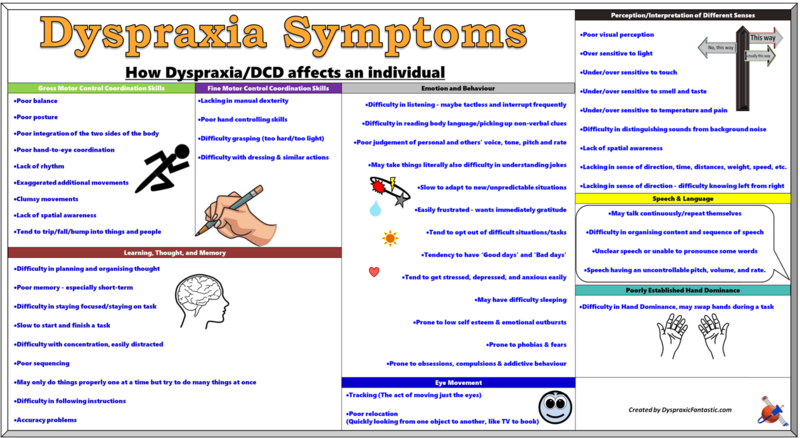 The table below the brainstorm goes into depth on all the possible attributes of Dyspraxia. (I’ll be aiming to get a video of explaining Dyspraxia at some point). Please note: This is not for self-diagnosis and is for reference only, but if you haven’t got a diagnosis of dyspraxia and find yourself ticking off several attributes then arranging to get checked out by a professional, like an Occupational Therapist, is the way to go. Also, bear in mind that dyspraxics may not be affected by all that is stated below. Because dyspraxia is a wide spectrum of different areas of problems and degrees they can suffer from each one it is very important to understand that each dyspraxic person is different from the last. If you are going to help someone with Dyspraxia this knowledge is half the battle. The major difference between them is that dyspraxia is when the person is born with it, while apraxia is a loss of a function due to an injury or stroke etc. However, the conditions are much the same. Effects speech, difficulty in pronouncing words, and being understood. Affects the ability to build and draw, despite understanding the task at hand – it’s just the doing part. And so this is the end of this page, many thanks for having a read through and I hope it has been a good insight into what Dyspraxia/DCD is. The Dyspraxia Foundation is a great place to seek out additional information, so get check out their site: www.dyspraxiafoundation.org.uk. Other than that, thanks for visiting one of the most important pages of my blog! I think it’s important to remember that dyspraxia, while it can sometimes cause difficulties (along with the associated frustrations), can also be a fantastic asset! Personally, I really struggle with verbal communication and this, i think, leads people to underestimate me – which day by day erodes my self confidence – and thus further impacts my communication (a vicious cycle). This is my biggest (perhaps only significant) struggle, BUT, it’s something I’m actively working to address (CBT amongst other things) and will overcome. I’m also constantly getting lost (even on well trodden routes that are familiar to everyone else), tripping over things and dropping stuff. However, my poor memory and spacial awareness doesn’t bother at all me because I’m not hurting anyone (other than myself, possibly – still, no broken bones in 30-odd years!) and have developed techniques to overcome my memory issues, I have a sense of humour about it (getting lost tends to be a running joke with my friends), and have developed excellent (and transferrable) skills as a result – chiefly, organisation – planning routes/schedules. If someone has an issue with that – then surely that’s their problem, not mine? Also, I’ve been dyspraxic my whole life – this IS me, it’s part of who I am and not something that I have developed. I know no other reality and certainly wouldn’t want to change it at all. I think my life experiences (dyspraxia or otherwise) have made me who I am. I am (amongst other things) an Occupational Therapist (which I love and think is an ideal job for me) because I can really connect with, empathise and help people by applying my creativity and problem solving skills. I have also learnt the value of perseverance/determination (education was always a struggle, but I just passed my master’s degree!) and have developed excellent organisation skills (which have been essential for me). While I’m still terrible at football (which was quite isolating in school) it’s something that doesn’t really interest me anyway, Instead, I have ran 2 marathons and cycled over the Alps – not many of the kids who laughed at me in school could do that now! Dyspraxia is just one aspect of who I am, while it does influence who I am, it does not define me. Everyone is different. For me at least, dyspraxia is just a different kind of different. Thanks for your amazing comment! It’s great to see successful people with Dyspraxia out there that, despite setbacks and a clumsy nature, can still push forward. I’ve certainly been underestimated in the past and I do what I can to prove myself. It’s certainly a challenge and can have a huge impact on confidence. With your accomplishments and strong sense of who you are it shows that people shouldn’t underestimate you – anyone who does is a fool! For anyone with Dyspraxia it is important to accept it as who you are, which you have. Life does become a bit clearer and easier once you accept it. Thank you so much for providing this blog! I am 21 and training to be an Occupational Therapist at university! After being misdiagnosed by an educational psychologist telling me I had learnt how to deal with all my problems when I hadn’t, I had an awful breakdown which meant that I had to come off of my practice placement which was awful, and eventually they diagnosed me with severe dyspraxia. I had no idea that Dyspraxia UK existed and that occupational therapists do their assessments. Or I would have definitely gone private! After getting this diagnosis, I have been able to make sense of this condition through mainly your site and I realise now that it means I have so many positive qualities too and that I will hopefully make a good OT. Thank you so much!!!! It’s unfortunate that you got misdiagnosed, but it’s good to hear that you got the correct diagnoses. I’m glad my blog has helped provide information for you and I wish you all the best in your pursuit of being a OT. Hi Ameliariley, thanks for your response it’s nice to see my blog reaching out to people. I’m glad you’ve got the diagnoses and finally the support you deserve! Hopefully in time more people will understand and having to fight for recognition will be a thing of the past. Thanks! your resources have been very useful to me in helping my daughter get the right support she deserves. I’m glad it has helped you and your daughter out! Our daughter has full diagnosis of Dypraxia, Dyslexia & the Sensory side, shes 9 and in Primary school in the uk. She gets no classroom help whatsoever as the school say she can ‘cope’ We have had to get Childrens mental Health team involved as she clearly isnt coping but that help a little but dint change anything for her in school sadly. She comes home exhausted and frustrated everyday but as the school see her as having no ‘sen’ she is fighting this alone. Many children with Dyspraxia fight alone, and from first hand experience I can understand your frustration with the school for not doing what they can for your daughter. In fact for a girl Dyspraxia is even harder than in boys considering the differences and the rarity. I suggest the best cause of action is to contact those who diagnosed her and see what they suggest, or contact the Dyspraxia Foundation…they have the resources and mounds of knowledge available to help you and your daughter. If that doesn’t work then maybe a change of school to one more equipped to help is the solution-of course I realise the complications of it and it’s a big decision to make. Thanks for taking the time to do this. I am a dyspraxic student at Cambridge University in the UK and your website has certainly helped me, and I am sure a great many other people. Keep up the good work. Thanks Ben, I’m glad it’s helped you out. Please feel free to recommend to anyone you think will benefit. Also if you don’t mind do you get the adequate support at Uni? Thank you for your feedback! I will try my upmost to keep it going!